Antithrombin III is a protein in the blood that blocks abnormal blood clots from forming. It helps the body keep a healthy balance between bleeding and clotting. Congenital antithrombin III deficiency is an inherited disease. It occurs when a person receives one abnormal copy of the antithrombin III gene from a parent with the disease. The abnormal gene leads to a low level of the antithrombin III protein. This low level of antithrombin III can cause abnormal blood clots (thrombi) that can block blood flow and damage organs. People with this condition will often have a blood clot at a young age. They are also likely to have family members who have had a blood clotting problem. People will usually have symptoms of a blood clot. Blood clots in the arms or legs usually cause swelling, redness, and pain. When a blood clot breaks off from where it formed and travels to another part of the body, it is called a thromboembolism. Symptoms depend on where the blood clot travels to. A common place is the lung, where the clot can cause a cough, shortness of breath, pain while taking deep breaths, chest pain, and even death. Blood clots that travel to the brain can cause a stroke. The health care provider can also order a blood test to check if you have a low level of antithrombin III. 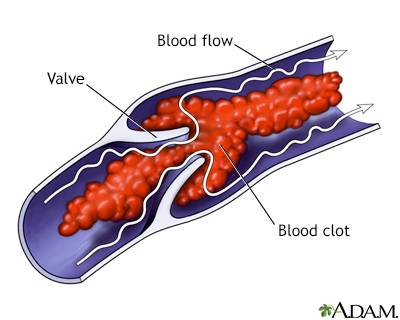 A blood clot is treated with blood-thinning medicines (also called anticoagulants). How long you need to take these drugs depends on how serious the blood clot was and other factors. Discuss this with your provider. Most people have a good outcome if they stay on anticoagulant medicines. Blood clots can cause death. Blood clots in the lungs are very dangerous. See your provider if you have symptoms of this condition. Once a person is diagnosed with antithrombin III deficiency, all close family members should be screened for this disorder. Blood thinning drugs can prevent blood clots from forming and prevent complications from clotting.